Elizabeth Black left a promising Pittsburgh art career to join American Red Cross efforts during World War II. 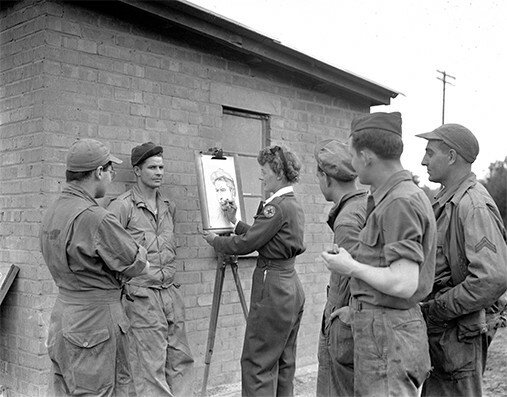 She proposed a unique project to sketch hundreds of soldiers, sailors and airmen throughout Europe and send the treasured portraits to worried families back home - all across America. Seventy years later, Black’s son uncovered her fascinating memorabilia and shared it with WQED. The poignant story unfolds as we explore Black’s lost art career, seek out elderly veterans who encountered Miss Black on the battlefield, and present to amazed and appreciative families portraits that never arrived. Portraits for the Home Front is brought to you by WQED's Emmy® winning team of producer/writer David Solomon and photographer/editor Paul Ruggieri, with narration by Michael Bartley. Elizabeth Black's family discovered copies of about 100 portraits in her collection. WQED is working to find the surviving veterans or descendants who might be interested in these keepsake portraits drawn by Elizabeth during WW2. Please share this page with veterans organizations or others who might help WQED connect these sketches with appreciative families. Watch for new portraits and corrected info as we receive it.